really useful word needed when tasking anyone to write or complete a sentence. 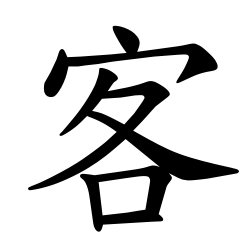 The character 句（ㄐㄩˋ） means sentence. Here is the stroke order animation and pronunciation. Here are the individual strokes for writing the character. Here is the definition in Taiwanese Mandarin. Here is the evolution of 句. Now Easter has gone the guests and visitors will be also so if you need to write about them in Chinese here are the characters. 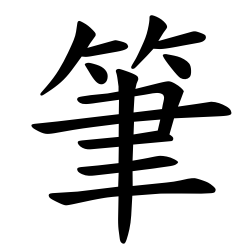 The character 客（ㄎㄜˋ） means guest or visitor. Here is the stroke order animation and pronunciation. Here are the individual strokes for writing the character. Here is the definition in Taiwanese Mandarin. Here is the evolution of 客. Not to be mistaken for J. Not sure what a radical is though. The radical 亅 is pronunced （ㄐㄩㄝˊ）. It is a vertical line with a hook at the end. A couple of characters with the radical are 了 and 事. 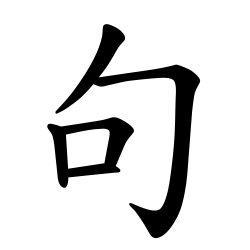 The character 午[ㄨˇ] means noon. Here is the stroke order animation and pronunciation. Here are the individual strokes to write 午. Here is the definition in Taiwanese Mandarin. 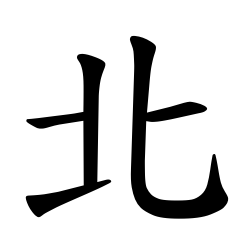 Here is the evolution of 午. A wonderful story about bilingual families. “They now speak the language fluently, have an understanding of Chinese culture and feel at home living in Beijing rather than seeing themselves as visitors. Laura can write her Chinese name, recognizes many Chinese characters, and can write simple characters. ….That kind of educational program is not for every family. Some expatriates would dearly love their children to learn Mandarin but realistically, have to stick with schools that offer the language of their native country, and a curriculum that is broadly similar to that at home. …Australian Mathew Alderson has two children in local schools, Nik, 7, and 4-year-old Natalia, and after two years of immersion, can see the pluses and minuses of this kind of approach. There might not be much in the way of touchy-feely teaching methods, but the trade-off is kids who are fluent in Mandarin and whizzes at math. …Although trips to Australia are infrequent, Dean tries to ensure the boys know all about that country’s culture, history and sport. He has even taught them the words to Waltzing Matilda, Two Little Boys and other classic Australian songs, and explained the rules of cricket. Few parents like to be corrected, or contradicted, by their children. But there are exceptions to that general rule: Expatriate parents living in China tend to swell with pride when their Mandarin-speaking children point out that mum and dad are totally mispronouncing words, or hopelessly mangling grammar. Children born in Beijing, or who arrive in the capital at a very young age, have every chance of attaining fluency in Mandarin. It is not uncommon to see blond-haired children chatting away colloquially, having naturally mastered the tricky tones that adult learners find so fiendishly difficult. For babies and toddlers, chances are they will spend much of the day with their ayi (domestic helpers), individuals who rarely have any language skills apart from their native Mandarin. Some parents ensure that their kids are bilingual by sending them to schools where classes are given in English and Mandarin. Australian Laura Faulkner, 6, and her brother William, 4, have attended several such schools, allowing them to switch with ease between English and Mandarin. Their Beijing-born sister Tessa, who is 18 months old, can also understand both languages. When the Faulkner family moved to Beijing four years ago, hotelier father Michael and teacher mother Michelle viewed it as a great opportunity for their children to grow up speaking, reading and writing Mandarin, skills that are almost certain to be major assets on their resumes in the 21st century. “We thought it essential that they were able to communicate with other children, in the park or in the playground, and we looked for a bilingual kindergarten,” says Melbourne-born Michelle, who is also studying the language. Although the Faulkners’ spell in the city will be finite – Michael is manager of the new Swire hotel, East – they are convinced a bilingual education for their children will be beneficial both now and in future. That kind of educational program is not for every family. Some expatriates would dearly love their children to learn Mandarin but realistically, have to stick with schools that offer the language of their native country, and a curriculum that is broadly similar to that at home. International schools in Beijing do make an effort to include Mandarin lessons in the curriculum, scheduling up to five hours of classes weekly, but it is not really enough for the students to reach any real level of fluency, especially if they have limited opportunity to speak the language at home. Bilingual schooling offers a halfway house where, in theory, youngsters become proficient in both languages. Critics argue that there is a danger of their overall education being diluted by participating in such a hybrid system. There is a third, more radical, option open to expatriates that pretty much guarantees that their kids will become fluent in Mandarin. Some local public schools have international divisions that accept foreign passport holders, although there is no attempt to modify the local rote-learning system. Australian Mathew Alderson has two children in local schools, Nik, 7, and 4-year-old Natalia, and after two years of immersion, can see the pluses and minuses of this kind of approach. There might not be much in the way of touchy-feely teaching methods, but the trade-off is kids who are fluent in Mandarin and whizzes at math. “While we remain committed to the attainment by our children of a high level of Mandarin fluency and literature, after several years of exposure to the Chinese system we are now starting to better understand the price that must be paid for this,” says Sydney-born Alderson. The Alderson children, who speak Russian at home with their Ukrainian mom Sasha, will most likely go to an international school at some future date, which means the annual fees will quadruple. The cost of a year’s schooling at international establishments such as the Western Academy of Beijing, Harrow or Dulwich, nudges the $30,000 mark, almost four times the cost at local public schools that accept foreign students. One significant factor for parents who ultimately aim to have their children attend university in their native country is that schools such as No 55 Middle School offer the International Baccalaureate system, which is recognized by institutions of higher education in Australia, Europe and the United States. Whichever system they choose – bilingual education, local school or personal tutor – no parent is likely to regret insisting that their child learns Mandarin. It is certain to be an asset in the 21st century, as China continues to grow, and links with other countries become closer. Australian Rob Dean – a fluent Mandarin speaker – is determined that his two boys will grow up bilingual. Both attend Fangcaodi Elementary in the heart of Beijing, a public school that has an international wing, where children of all nationalities receive all their lessons in Mandarin. Dean and his wife Ruan Yixuan reasoned that would be the best way to ensure the boys have total command of Mandarin from an early age – although they may well attend an international school at a later stage. “I studied Mandarin and have lived in China for 18 years, so I know just how hard it is,” says Dean. “My wife and I discussed their education and we agreed on letting them do their primary education in Mandarin with an eye toward getting a firm grip on the language that will remain with them for life. Obviously learning Mandarin is much easier when your brain is young and free of beer! For all that, Dean recognizes the drawbacks of the system, in particular the lack of emphasis on creative thinking and the limited sporting opportunities. The school takes the traditional view that children are there to learn as much as possible in a disciplined environment, not to be mollycoddled. So far, Dean is happy with the results. Lachlan, 9, reads and writes fluently in Mandarin and is also fluent in English, while Oliver, 6, can write stories that utilize several hundred characters. The brothers speak English at home with their father and – of course – watch English-language television from Australia, the US and the UK. The family is likely to be in Beijing for some years to come given that Dean runs a successful employment communications agency that helps companies attract, and keep, talented staff. Although trips to Australia are infrequent, Dean tries to ensure the boys know all about that country’s culture, history and sport. He has even taught them the words to Waltzing Matilda, Two Little Boys and other classic Australian songs, and explained the rules of cricket.